The statement includes a dozen shareholder proposals — all of which are opposed by the company’s board of directors — as well as disclosures of the company’s executive compensation, changes coming to its board and more. 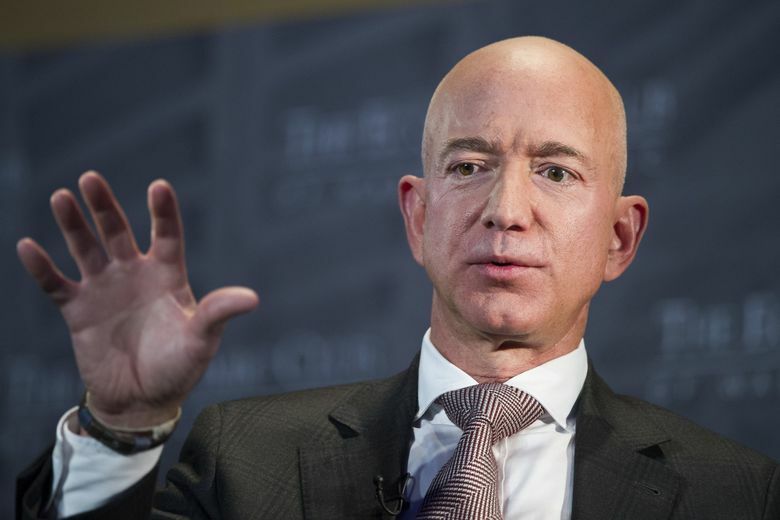 In an accompanying letter to shareholders, Amazon chairman and chief executive Jeff Bezos challenges other major employers to match or exceed the company’s new $15-an-hour pay floor. The median total compensation, meaning half were paid more and half were paid less, for Amazon employees worldwide in 2018 was $28,836, up $390 from 2017, according to the proxy statement. In the U.S., where Amazon’s new $15-an-hour minimum wage took effect Nov. 1, the median was $35,096 — a new metric reported for 2019. The company said the new wage floor would benefit more than 250,000 Amazon full- and part-time employees and more than 100,000 seasonal workers. The filing notes that Amazon also provides medical benefits starting the first day on the job, retirement contributions, parental leave for mothers and fathers and career-development programs — benefits that are not included in total compensation calculations. Bezos’ compensation in 2018 was unchanged. The world’s wealthiest person collected a salary of $81,840 and the company spent $1.6 million on personal security arrangements. Neither the shareholder letter nor the proxy statement made reference to Bezos’ divorce from MacKenzie Bezos, which will diminish his ownership stake but not his voting rights. Jeff Bezos owns 16% of Amazon as of Feb. 25. When the divorce is finalized, MacKenzie Bezos is expected to own 4%, which would make her the fourth-largest owner of Amazon behind Jeff Bezos, The Vanguard Group and BlackRock. Amazon’s CEO pay ratio — a required disclosure of the top executive’s pay compared to that of the median employee — was 1-to-58 in 2018. It was 1-to-59 in 2017. Other senior Amazon executives receive much more than Bezos, mostly in the form of stock awards. The CEOs of Amazon’s two biggest business units — Andy Jassy of Amazon Web Services and Jeff Wilke of the worldwide consumer business— each received total compensation of over $19.7 million. Senior vice president Jeff Blackburn received $10.4 million and chief financial officer Brian Olsavsky received $6.9 million. The CEO pay ratio for Wilke, whose organization includes the warehouses and logistics operations where Amazon’s lowest-paid employees work, works out to about 1-to-684. Amazon faced an unprecedented barrage of shareholder proposals related to environmental, social and corporate governance issues as part of a coordinated strategy by activist investors affiliated with the Interfaith Center on Corporate Responsibility. Of the 15 proposals, 12 were included in the company’s 2019 proxy statement and will come up for a vote. An annual report on environmental and social impacts of food waste from the company’s operations. An amendment to the corporate bylaws to allow shareholders of 20 percent of Amazon stock to call a special meeting. The present threshold is 30 percent. An independent study of the privacy and civil-rights implications of Amazon’s facial-recognition technology, Rekognition. A report on Amazon’s efforts to address hate speech and sale of offensive products. An independent chair of the board of directors. Bezos is presently board chair and CEO. A management review of sexual-harassment policies and assessment of whether additional policies are needed. A public report describing Amazon’s plans for disruptions caused by climate change and reductions in its companywide dependence on fossil fuels. A report on Amazon’s “global median gender-pay gap,” including risks related to recruiting and retaining women employees. A report assessing the feasibility of including sustainability metrics such as social and environmental considerations, and diversity of senior executives, into senior executive compensation plans. An end to “formula swapping” — the Amazon practice of counting shareholder votes differently for management proposals than for shareholder proposals. Instead, all nonbinding matters would be decided by a simple majority of votes cast for or against an item. Tom Alberg, a co-founder of Seattle venture-capital firm Madrona Venture Group and Amazon’s longest-tenured board member apart from Bezos, will not stand for re-election at the annual meeting, Amazon disclosed in the proxy. Alberg recounted being impressed with Bezos and his “very coherent business plan.” He backed the company as part of an initial $1 million funding round. Alberg’s departure leaves Patricia Stonesifer as Amazon’s longest-tenured board member besides Bezos. Stonesifer, 62, joined Amazon’s board in February 1997. Nine other board members, including new appointees Indra Nooyi, the former top PepsiCo executive, and Rosalind Brewer, chief operating officer of Starbucks and a former Walmart executive, are standing for election at Amazon’s annual meeting of shareholders. If the full slate is elected, Amazon’s 10-person board would have five women. The meeting is set for Wednesday, May 22, at Fremont Studios in Seattle.